Posted 4 May 2016 & filed under 1930s, 1940s, 1950s, 1960s, 1970s, 1980s, 1990s, 2000 -, Foster. Vic, Retail, Shops. 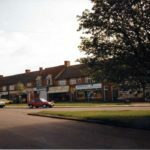 The shops in Vesta Avenue originally consisted of three shops: St Julian’s Stores at one end, Holdham’s Butchers in the middle and St Stephen’s Stores at the other end. In between was waste ground. 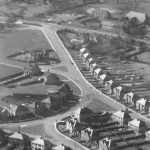 These three shops were built when the St Julian’s housing estates were built in the 1930s. The other shops that are now in between them were built in 1952. The middle shop was intended to be an off-licence run by Watney’s brewery but this did not happen. The off licence went to the first shop, run by Mr Grout.The middle shop became the butchers. St Stephen’s Stores was a grocery and also sold sweets, tobacco, newspapers and stationery. It was also the Post Office. Mr Oswald owned the stores. He worked in some official capacity on the railways and lived in London. 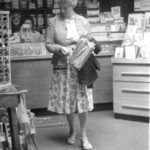 He put his life savings into buying the Post Office shop and in about 1950 extended the shop and added living accommodation. He conceived the idea to build the parade of shops and applied to the council for permission to build. It was granted on the understanding that no two shops apart from the originals would sell the same goods. He then built the units and rented them out. He also had the bright idea to include a cafe in his shop to provide refreshments for the workers. He and his wife retired in 1965 when they were both well into their eighties. he sold the shops and moved to a big house in Radlett. The shop was then taken over by Mr Worsley followed by Mr Brisco. After that came Mr and Mrs Mason – they introduced self-service. Later the Post Office part was run by Margaret Cochrane. When the Masons retired, Mr and Mrs Patel took over. The shop became part of the Londis chain. At the other end of the parade, St Julian’s Stores run by Mr Grout was another general store as well as an off licence. There was a ladies hairdresser above the shop run by Mrs Grout. When Mr Grout retired, the shop was sold to Jack and Flo Warner, followed by Mr Bahl and the Mr Mandrha. It is now the local Costcutter. 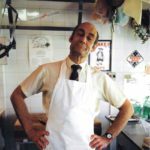 Vic Foster took over Holdham’s the butchers in 1972. Previous to that he was employed as a manager with Holdham’s. Holdham’s was double fronted. When Vic first moved into the shop, he traded from the left-hand side. They used the whole of the shop but the counter was on the left and the refrigerated units were on the right. His landlord, Tony Holdham, the son of R.E. Holdham lived in the flat above: “When I bought the business in 1972, I said I don’t want this whacking big shop so I cut it in half. Peter Holdham had it altered to make a small shop on the left-hand side, so I moved into the right-hand side“. The left side was then run as a bakers (Howard’s) and then a greengrocers for a while. 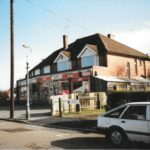 Vic Foster retired in 2006 and his shop became an African takeaway and then an Indian takeaway. During the war the middle shop was empty, the upstairs accommodation was occupied. I knew the two girls, Mavis & Pauline Jones. At one time the shop was occupied by the army and later by a scout group of which I was a member for a while. 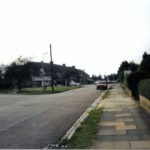 I went to St Adrians in 1976 and lived at 5 Vicarage Close which was newly built as the first family in 1971. I remember the day one of the great Cedar trees lost a branch. I was playing in the back garden on a bright sunny day. I was no more than 4 years old. The noise was immense and the earth flew up higher than the wall around our rear garden. The trunk lay were trunks currently lie 40 years later I visited recently 15/02/2019. There used to be rope swings hung around the lower branches a d children constantly running around it. It was a miracle nobody was hurt that day, timing I guess. Many more tree limbs have been taken down now, sad to see so much of this great trees majesty removed. I believe a retired priest now lives in my first home my mother and sister knocked and introduced themselves. Nothing much has changed in that time saved a bay window instead of a flat facade We moved when I was 7, in 1978 but I still have vivid memories of the hot summers and straw hats. I had a friend at school called Jenny her dad ran a fish and chip shop a couple of doors down from the sweetshop. My best friend was Michael Duffy. The sweet shop, Masons is exactly as I remember it in the black and white photo. 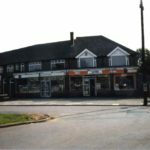 We often stopped in for sweets and walls vanilla ice cream between waffers.I remember the post office to the right as you went in. In the summer a play group would congregate by the pond and would have activities, painting etc. One bright summers afternoon I remember watching a lady water colourist painting the Cedar tree. It has always been a lasting memory for me. St Adrian’s had nuns running the classes from 8 years onwards and they were very dear old ladies to us as children as were the dinner ladies who always had a smile and seconds for us, we really loved them!. I remember the grocers at the other end of the parade as well, mainly because it also sold sweets etc, the mind if a child, fuel for running playing war riding bikes and adventuring. The walk seemed an age as a small child, 2 mins in reality. The other side of the field opposite our rear windows seemed wild as did the wood by St Stephen where we collected conkers in autumn and found endless entertainment all summer long. I had no idea about the rich history of thr area, only the time Roman aspect. I am constantly amazed. Keep up the good work. Thanks for the comment. Lovely memories Charles. Sandy I think I could dig out some other photos of 5 vicarage close that could be posted, not sure how to get them to you though. How does one go about sending photos in for review?